I’m an awkward girl; I’m not up on fashion trends, my slang is two decades passe, and I’d rather drink wine at home than be surrounded by 100 people I don’t know. Dinner parties can really put me to the test, especially when I’m the hostess. I want everyone to have a good time, but I’m never entirely sure how to bring everyone together. That’s where Tajikistan can help. You know that moment, right as everyone sits down to eat? I refer to it as the calm before the storm. It’s a little bit awkward; there’s a pause while everyone gauges the mood of the room. What follows this quiet determines the success of every dinner party. 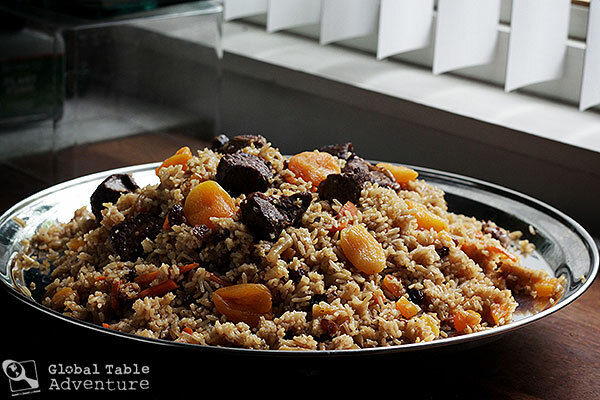 In Tajikistan, where there’s a crowd, there’s Plov. 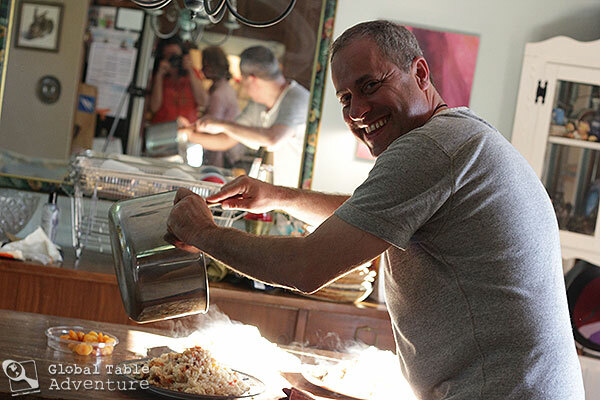 Pulling up to a giant communal platter of rice brings a natural closeness. By forcing yourself to dip hands into a communal platter breaks down any barriers and is a natural conversation starter. 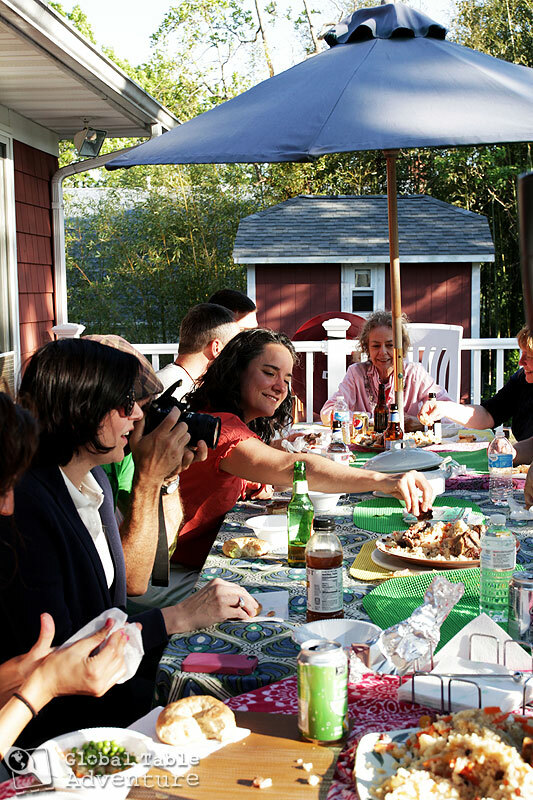 If your guests are unfamiliar with communal eating, the best thing to do is to give them some guidelines. It makes everyone more comfortable. 1. All hands must be washed. Even then, only use the right hand, as the left is traditionally used for unclean things. 2. Only eat from the part of the platter directly in front of you. Reaching to another’s section is considered rude and unsanitary. 3. Don’t shove your fingers in your mouth. Instead use your thumb to push the food off your index and middle fingers. This will help you neatly “drop” the food into your mouth. 4. If you have a really large group (more than 8) and are seated at a rectangular table, consider serving with several large platters. I doubled this recipe for 18 and used three medium platters, so everyone could reach. 5. Have fun and don’t be too uptight. If someone has lots of trouble with their hands, offer them a spoon. If someone is sick, offer them their own plate. Remember, this should be fun, not work. Put on some happy Tajik music. Let the rhythms pull you through the chop-chop-chopping. 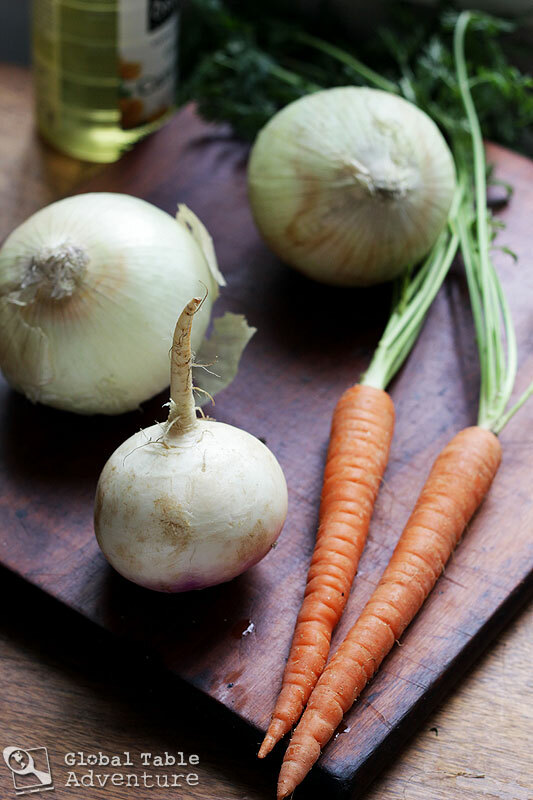 Dice the onion, then peel and slice the carrot and turnips into bite-sized sticks. Next, brown the meat in the vegetable oil. 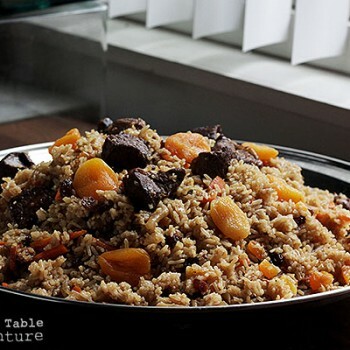 The recipe purposefully uses a lot of oil (traditionally, the fat would be from the mutton)… the oil gives the plov authentic, rich flavor that you’ll be craving for years to come. If there ever was a time to go for it, this would be it! Stir in the onion and continue to cook. It might take a good ten minutes to get the onion soft and brown. By then your house will almost smell like glorious Tajikistan. The finishing touch? Cooking down the carrots and turnips along with the cumin, salt, and pepper. While those soften, boil up the 4 cups water. Add the hot water and rice to the lamb mixture. Simmer 15 minutes uncovered. Then add raisins and quartered dried apricots. Cover and remove from the flame. Let rest this way 10-15 minutes. Fluff with a fork and invert onto a large platter. 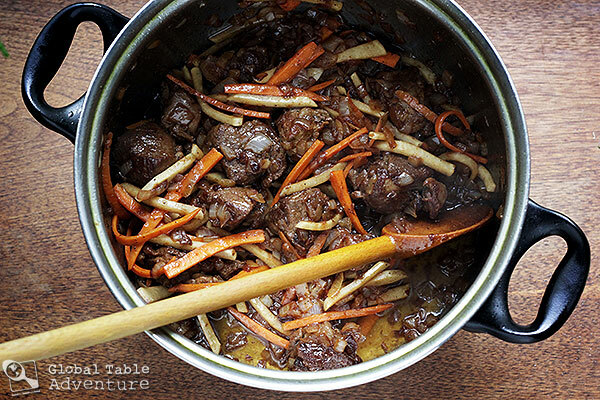 Pull the bits of lamb to the top for display purposes, and garnish with extra pieces of dried apricot, as desired. Enjoy with family, friends, and other loved ones. Use nan bread to help scoop up the food (recipe will be up tomorrow). 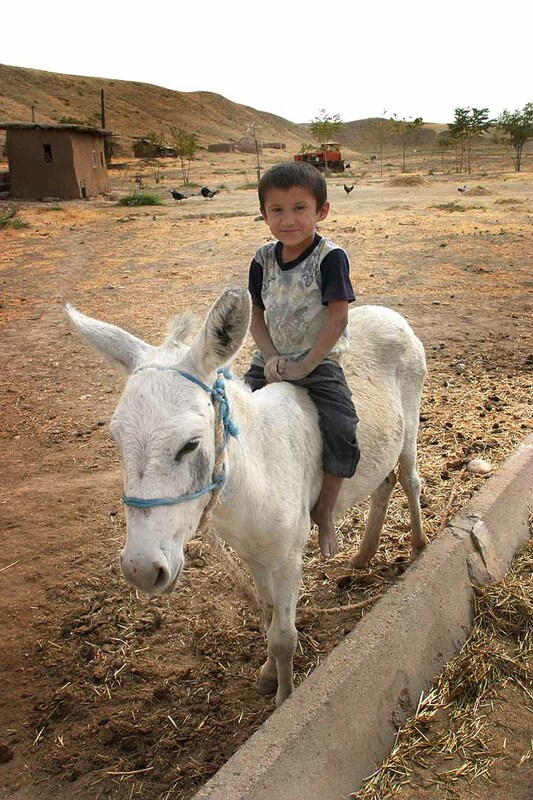 Then, instead of walking off your meal, go for a ride on your donkey. P.S. 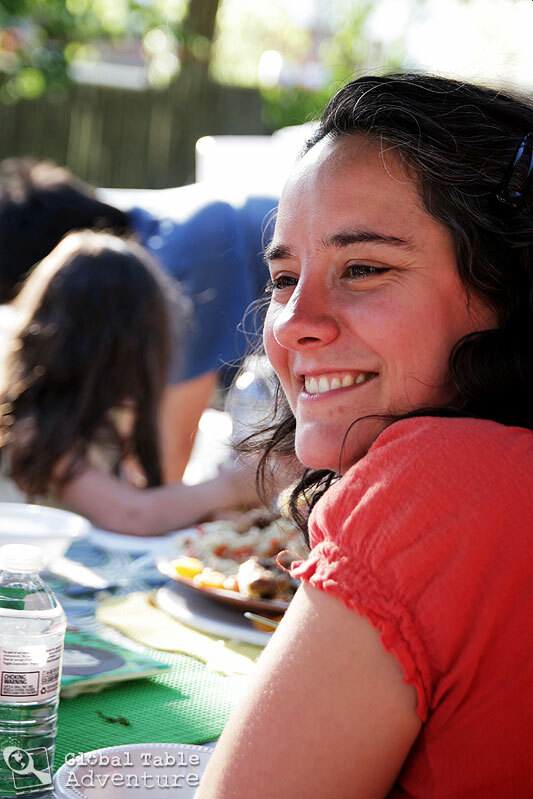 Have you ever eaten communally? What tips did I miss? Any techniques you’d like to add? A boy in Tajikistan. Photo by Steve Evans. Brown the meat in the vegetable oil. 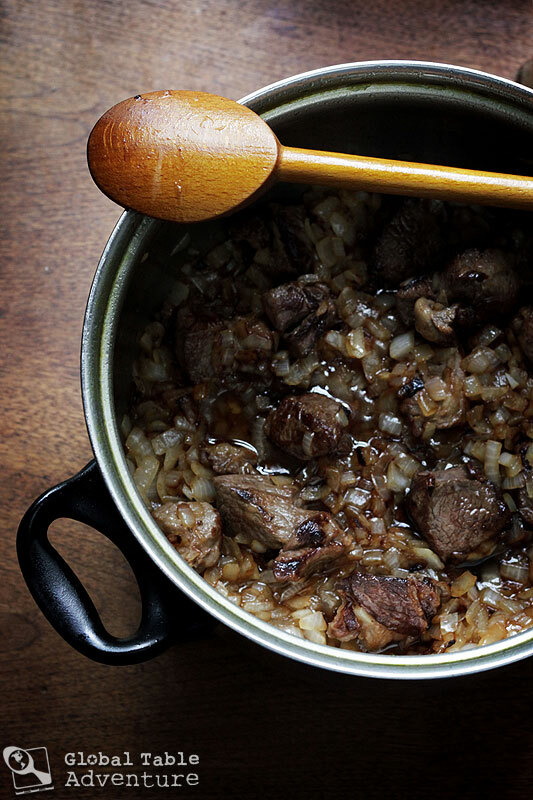 The recipe purposefully uses a lot of oil (traditionally, the fat would be from the mutton)… the oil gives the plov authentic, rich flavor that you’ll be craving for years to come. If there ever was a time to go for it, this would be it! Stir in the onion and continue to cook. It might take a good ten minutes to get the onion soft and brown. 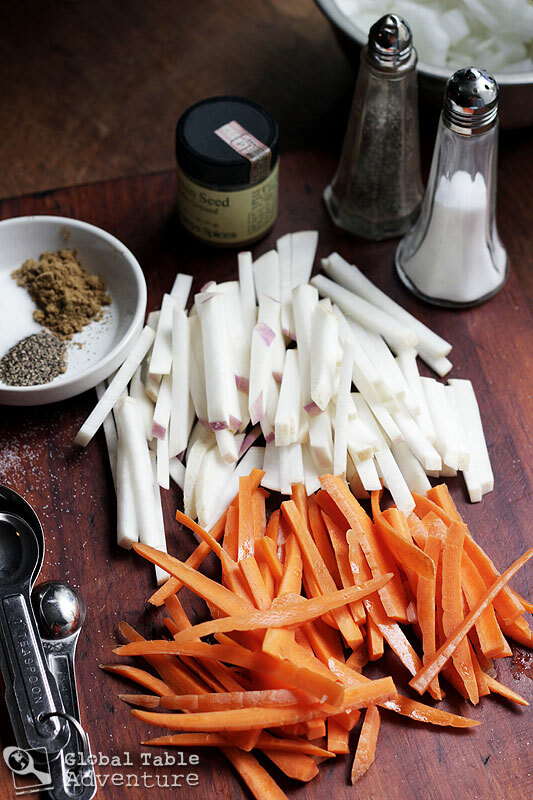 Cooking down the carrots and turnips along with the cumin, salt, and pepper. While those soften, boil up the 4 cups water. My kids LOVE you! I always tell them to eat with their knives and forks and now…..they can eat with their hands!! I spent many many happy summer nights in Russia on the embankment of the volga river eating plov from the tajik street venders! They made it in these giant metal bowls the size of a trash can lid. So so so deliciously comforting! I can’t wait to make this recipe! Thank you so much for this wonderful trip down memory lane! I love eating with my hands. There is just something so magic and the food seems to taste better! I rarely used spoons and forks when traveled in India! Another tip about the plate-sharing: in India and the middle East often the food is picked with a piece of naan bread. Other than that – love your posts. My best friends are from Tajikistan and I remembered them when saw your post in my FB feed. Ah, yes! That’s what we did…. though the bread seems very different than other naan I’ve seen. The banana leaf is missing – just kidding! When I was traveling all over Malaysia, we stayed with Tamil Indian relatives of our friend and always had the curries served on a banana leaf. The women ate traditionally in the kitchen, though, and we, honored guests, shared our meals with the men. I love the combination of sweet fruit and lamb. And the photos are, as always, beautiful. thanks for this recipe, Sasha! 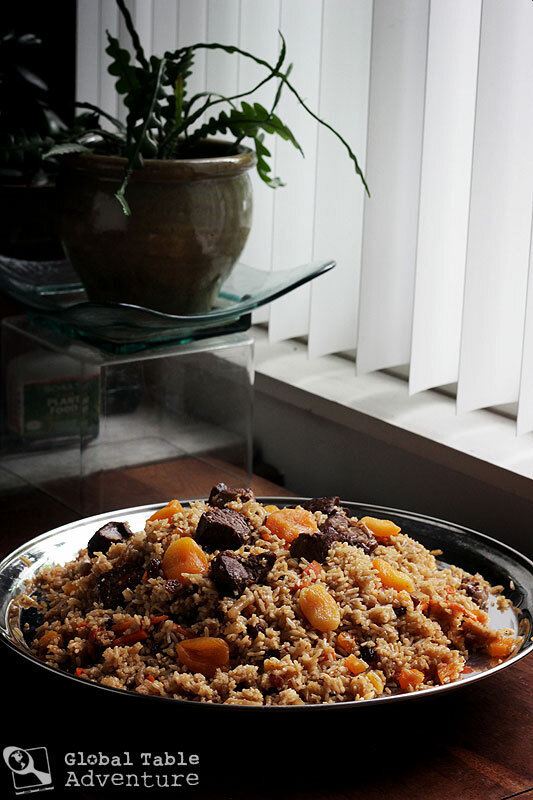 I recently visited the Dushanbe Teahouse in Boulder Co, and loved the Tajikistan Plov. Came home and searched for a recipe and yours came up! 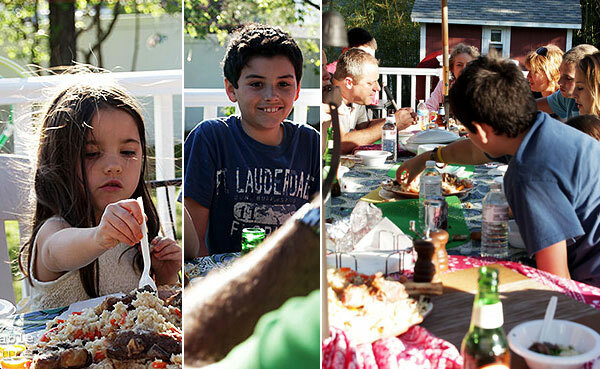 Love your website project: Eating Around the World. Will check back often! Hi Sasha! I’m Zul’fiya. I’m an exchange student from Dushanbe,Tajikistan. 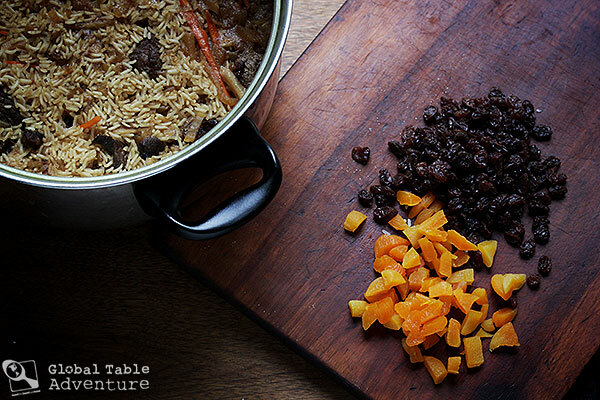 I love plov very much too. I was looking for our national food videos in English. And I found your video sharing Tajik plov and non. I was so excited seeing all about these. Thank you very much for sharing and letting other people know and try Tajik national food. So we made this recipe for Christmas dinner and it was TOO good! I say “too good” because I ate like a maniac and ate so much I felt sick afterwards.